Stamps celebrating the marriage of Prince Harry and Meghan Markle on 19th May 2018. 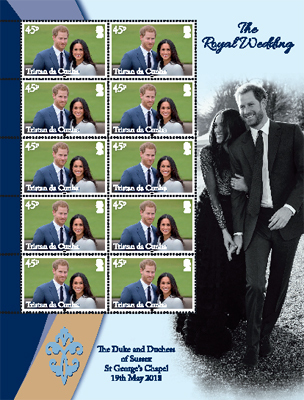 These stamps celebrate the marriage of HRH Prince Henry of Wales (usually known as Prince Harry) and Ms Meghan Markle on Saturday 19th May 2018 at St George's Chapel, Windsor. 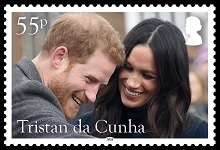 Prince Harry and Ms. Markle, an American actress best known for her role in the Canadian-American legal-drama television series Suits, had officially been a couple since November 2016. 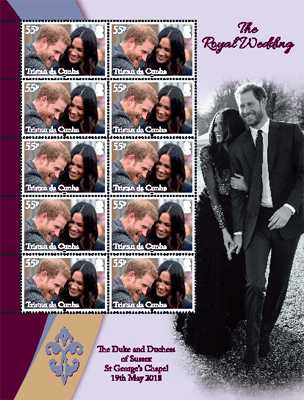 After the engagement, Ms. Markle began the long process of becoming a British citizen. 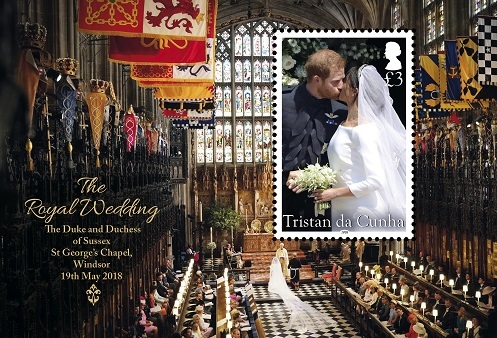 Like families in the UK, Tristan islanders were also able to watch live the royal wedding on television and celebrate the special day. 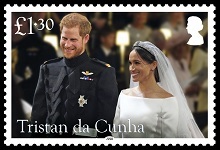 On the morning of the wedding it was announced that The Queen had conferred a Dukedom of Sussex on the Prince. 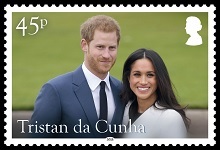 His official titles are therefore Duke of Sussex, Earl of Dumbarton and Baron Kilkeel. On her marriage to The Duke of Sussex, Ms. Meghan Markle is known as Her Royal Highness The Duchess of Sussex. Members of the public played a big a role in the wedding, with many choosing to wait overnight. The night before the wedding, the then Prince Harry and The Duke of Cambridge met some well-wishers in Windsor. 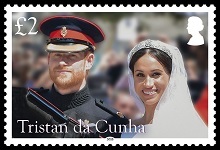 The Duke of Sussex is sixth in line to the throne and the younger son of The Prince of Wales and Diana, Princess of Wales. His Royal Highness spent ten years working in the Armed Forces, ending operational duties in 2015. During his service, he conducted two tours of duty to Afghanistan with the British Army. The Duke now spends his working life supporting a number of charitable activities and projects, notably the Invictus Games, and carrying out public duties in support of The Queen. His Royal Highness's official residence is Kensington Palace in London. 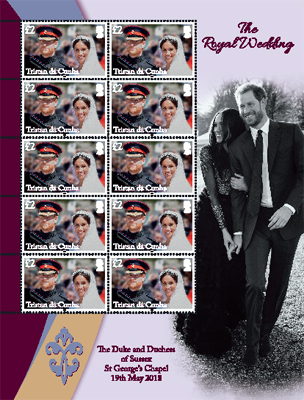 The stamps and pictoral borders show the happy couple during their engagement and wedding. 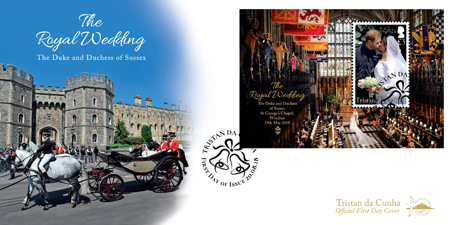 The sheetlet shows their marriage ceremony in St. George's Chapel, Windsor, and the first day cover shows them returning from the ceremony in the Ascot Landau Carriage.